Visit our Service Center. Let us provide you with the best security. 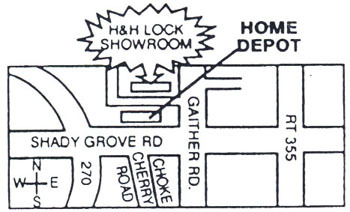 H&H Lock and Security is a family owned lock and security company providing service since1972. From our location, we service Maryland and Washington, DC. areas including: Montgomery County, Ashton, Aspen Hill, Beltsville, Bethesda, Boyds, Brookeville, Cabin John, Chevy Chase, Clarksburg, College Park, Columbia, Damascus, Derwood, Dickerson, Frederick, Frederick County, Gaithersburg, Garrrett Park, Germantown, Glen Echo, Hyattsville, Kensington, Ijamsville, Laurel, Mt. Airy, Olney, Poolesville, Rockville, Sandy Spring, Silver Spring, Spencerville, Takoma Park, Urbana and Wheaton. We have openings for experienced locksmith techs. Please contact us at our email hhlock@erols.com or call our office at 301-948-1996. Our professional staff will provide your security needs for sales, service and installation. See us for High Security locks that restrict key duplication. We have a large inventory and have an established network of nationwide distributors, which allows for quick availability of materials. Contact our office and showroom. Let us provide you with the best security.